The GoPoint Internet Kiosk was a conceptual platform that offered a set of Internet available products in retail stores. It was tested in two Concept Stores in the summer of 2000 in Phoenix and Mesa, Arizona. Expressing the RPM brand through car culture, the GoPoint Internet kiosk interface is inspired by forms commonly found within contemporary car design. The kiosk was placed within the RPM Concept Store to test products and services that could eventually migrate to the RPM Cash Management Machine, or another format yet to be developed. The interface was designed to attract attention and usage while quickly and succinctly communicating the products and services available. The purpose of GoPoint was to test potential new products to be offered on the company's more advanced financial services kiosk (RPM). 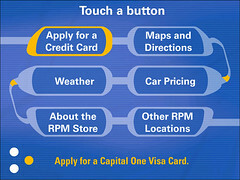 Content included a credit card application offered by Capital One, maps and driving directions from MapQuest, car-pricing information from Kelly Blue Book, and an instructional animation explaining how to use all of the kiosks at the RPM Concept Store. The physical design of the kiosk was completed and hardware components were selected before I was asked to join the project. I had less than a month to determine a way to operate an Internet access terminal in an unsupervised environment. I was required to source kiosk software (for customer usage and remote maintenance), lead the interface design process, create the user experience and interaction flow, work with third party content providers for content and technical integration, and lead the technology development effort.